In honor of ghosts, goblins, and William Shakespeare, spirit on over to the Academy of American Poets collection of Halloween poems. It’s a treat. While you’d be lucky to find one of the 10,000 Shakespeare face masks (shown above) commissioned to commemorate the 400th anniversary of the Bard’s demise, you can download, color, and create your own from the Shakespeare 400 Chicago Talk Like Shakespeare Day site. Lake’s plenty deep, dive off the cliff. it will rain, I know when to shut up. enough, no doubt I’ll be rich. to speed. I will never get caught. I know she’ll call, she wouldn’t leave. I won’t miss her at all. *Copyright 2016 by Timothy Pilgrim. Broadside illustrated by Mat Hudson. Looking for inspiration? Join Atlas Obscura tomorrow afternoon, Halloween Eve, Sunday, October 30, 2016, for a walking tour of Seattle’s history-rich Lake View Cemetery. National Novel Writing Month (NaNoWriMo) celebrates its 18th year of encouraging creativity, education, and the power of the imagination through the largest writing event in the world. This year, NaNoWriMo expects nearly 500,000 people to start a 50,000-word novel in the month of November, guided by this year’s theme: Your Novel, Your Universe. More than 250 NaNoWriMo novels have been traditionally published. 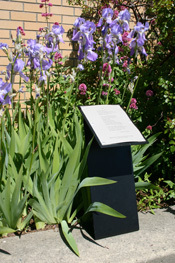 Many poets use the project as a challenge to write a poem each day of the month. To find out more, sign up, get pep talks, participate in forums, and get inspired, visit the NaNoWriMo website. 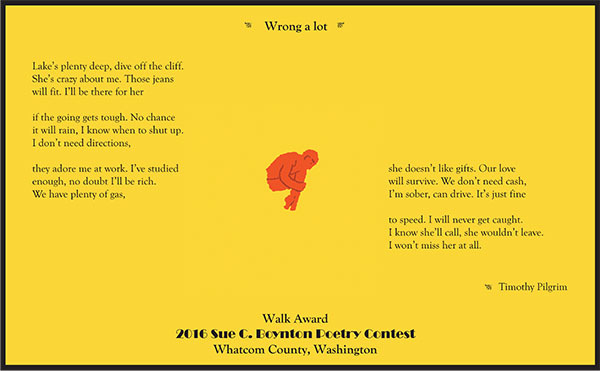 Writer’s Digest will offer the 2016 November PAD (Poem A Day) Chapbook Challenge. Robert Lee Brewer, author of the Poetic Asides blog, will post a prompt each day. The idea is to write a poem in response to that prompt and then, at the end of the month, assemble and submit a chapbook of the best 20 or fewer of your poems. Find out all the details on the 2016 November PAD Chapbook Challenge: Guidelines page. November also brings the Cascadia Poetry Festival (Seattle, Nov 3-6) and Wordstock (Portland, Nov 5). Daylight Saving Time ends on Sunday, November 6, 2016, 2:00:00 AM, when clocks are turned backward 1 hour to 1:00:00 AM local standard time. Looking for a last-minute getaway? There is still room available for the Northwest Writers’ Weekend, which is held Friday-Sunday, November 4-6, 2016, at Pilgrim Firs in Port Orchard. The weekend is: four two-hour class sessions (three class choices each session), free time for writing, meals together, teacher readings/concert, all-camp reading/concert, cozy cabins, beautiful wooded surroundings. Classes include…Songwriting: Song Seeds; What Your Characters Whisper; Finding New Voice in Persona Poetry; Songwriting: Poem to Lyric and Back; Write With Your Mouth, Edit With Your Ears: How to Make Your Writing Whisper, Growl and Sing; Using Lyrics in Stories; The Devil You Know: Keeping Your Inner Critic At Bay; “Poem in a Box”: The Prose Poem; Getting To The Point: The Essay and The Kinship of Ideas; Songwriting: Woodshedding. Visit the Northwest Writers’ Weekend website for details.